We've had the soft launches, the business alerts and undercover detail. Now London 2012 are firing all their PR bullets at the Great British public to encourage them to plan ahead for travel during the Olympics. If you live in York or Edinburgh you probably won't care. But for those who live/work near a Games venue, or are planning to travel to one, this stuff matters. Sorry, what's that, you're bored already? No, really, this stuff is important, else how stupid are you going to look in the summer when your usual travel plans collapse? Although admittedly whether or not you can vary your working day may depend on the nature of your job and the foresight of your employer, not your willingness to adapt to change. And your travel plans might not yet be firmly enough established for any of this transport information to be of any use... at the moment. So is the new 2012 travel website any use for forward planning, or is it high level bluster? Let's see. On the Get Ahead of the Games website, each individual geographical area gets its own section. Weymouth, Windsor, Coventry... they're all there... basic message "don't drive" and "maybe you should catch the shuttle bus". I'm travelling to an Olympic event outside London during the second week of the Games, and I've deduced that the GAOTG webpage isn't really aimed at me, it's for the good folk who live nearby and need to be warned about local disruption. There is impressively detailed visitor information on the ordinary London 2012 website, but nobody's thought to link directly to that - the good stuff is at least five clicks away. But it's in London where the new GAOTG website attempts to shine a bright light on the effects of potential disruption. An interactive map shows how passenger hotspots will vary across the public transport network - a most useful spatial innovation - and a slider helps to see how impacts change from day to day. There's no information yet for the Torch Relay phase, nor the day of the Opening Ceremony, nor any of the Paralympics, so you can't plan ahead for any of that until later. But the big Olympic fortnight is supposedly fully covered. What the interactive map makes very clear is that the Jubilee line will be best avoided. 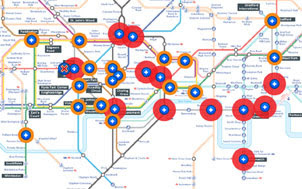 Big red circles announce "exceptionally busy" stations all the way from Bond Street to North Greenwich (and although Bermondsey and Southwark aren't marked red, I bet you'll never squeeze onto a train at either when one arrives). Other stations have been marked orange because they'll be "busier than usual", although not all stations that'll be busier than usual have been marked orange. For example Stratford International will most definitely be "busier than usual" during the Olympics, because it's pretty much dead usually, but that's not been marked orange. I suspect orange really means "significantly busier than normal, enough to cause delays", but the key doesn't say that. And then there are Wembley Park and Earl's Court, which must surely be "busier than usual" (with passenger delays) because they're adjacent to major Olympic venues, but they've not been marked orange either. This orange category of stations hasn't been appropriately named, or isn't yet complete, or probably both. There's one last category in the key - some stations have been marked with red crosses because they'll have "restricted operations". Apparently the only station thus affected is Marble Arch, which'll be mostly exit only, although in reality several more stations will have more restrictive restrictions. Pudding Mill Lane will be closed outright, Cutty Sark will be closed sometimes, West Silvertown and Custom House will be exit only, etc etc. Indeed the interactive map so far has very limited information about the DLR, which isn't especially helpful given that it'll be sorely affected during the Games. And it has nothing on National Rail, not unless you look at the text way below the map, where there's no specific information at all. What we have here is an incomplete "hotspot" map based on only one mode of travel, plus some broader stuff underneath that the public may or may not notice. The map also makes no attempt to reveal how demand will change during the course of each day, at least not in the surface detail. But click on the busy stations and a pop-up box reveals more timely information. Euston and King's Cross will be busiest in the morning peak, apparently, and mostly better later in the day. Bank will be overcrowded most of the time, so stay away. And Tower Gateway may look busy, but that's only between 5pm and 6pm each day, and at other times it's actually a recommended alternative to Bank. Overlook this level of detail and you might accidentally plan a route to avoid somewhere, based on simplistic generalisations, when in fact it was perfectly accessible after all. For more finely-tuned advice you need the specially-designed London 2012 Spectator Journey Planner... but is that linked from the new GAOTG website? No, only the normal TfL Journey Planner, which doesn't yet cover Summer 2012. So that's Get Ahead of the Games. You'll be sick of its transport-related cajoling over the next six months, because promotional megabucks are lined up to be hurled its way. A whole platformful of politicians and Olympians lined up yesterday to help launch the site, and it should provide a welcome jolt for Londoners who haven't yet engaged with Games-related transport planning. It might even be comprehensive and accurate before July, let's hope. 363 years ago today, on a cold wintry morning, Parliament gathered in London to kill its King. A lengthy Civil War had divided the country, until on 30th January 1649 the defeated Charles I was led to his place of execution in Whitehall. "This day his majesty was brought from St James, about 10 in the morning, walking on foot through the park, with a regiment of foot for his guard, with colours flying, drums beating, his private guard of partisans, with some of his gentlemen before, and some behind, bare-headed. The king came upon the scaffold, noticed the great crowd of people, walked around the scaffold and looked earnestly at the block, asked if it could not be set higher, then spoke to those present on the scaffold. After which, the king stooping down, laid his head upon the block, and after a little pause, stretching forth his hands, the executioner at one blow severed his head from his body. Then his head was put in a coffin." Though some were delighted, because it meant they could inflict a decade of joyless puritanism on the British people, others held a torch for the monarchy and awaited its restoration. King Charles II eventually swept back into power on a tide of national rejoicing, elevating his father to the position of Charles the Martyr. His statue still stands in Trafalgar Square, on a traffic island where once stood the original Charing Cross, and from which point all distances from London are officially measured. And it's here, every year on the last Sunday in January, that a wreath-laying ceremony kicks off a most unusual act of royal remembrance. 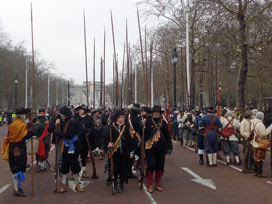 The English Civil War Society engage in a number of reenactments and displays annually, of which The King's Army Parade is their largest central London event. Only the Royalist divisions turn up - all the Parliamentarians either stay at home or dress in hi-vis tabards and act as stewards. 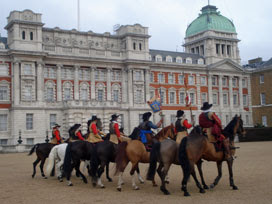 Soldiers gather at the foot of The Mall in their 17th century finest, a few on horseback, most on foot. They sport a variety of costumes in matching coloured fabrics, mostly tunic and boots, plus headgear that ranges from broad-brimmed hats to metal helmets. Some carry pikes which they wield in formation like a display team [photo], others wave muskets or beat drums, but most are more ordinary footsoldiers or historical hangers-on. It has to be said that the majority of the King's Army are over the age any recruitment officer would normally accept, and several have waistlines that could never tackle an assault course. But the assembled gathering makes a marvellous historic spectacle, both for those who've come to spectate deliberately and bemused tourists who just happened to be passing. Proceedings are rounded off with a final "God Save The King! ", which is ironic really, because poor Charles was the the only British King that God completely abandoned. And then everyone troops off back to The Mall, horsemen first, footsoldiers behind, for a last salute of the King's Standard. Everyone that is except for three officers with one final task across the road. 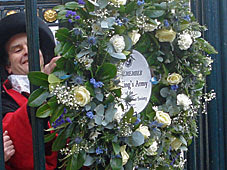 They pick up the commemorative wreath, which all departing participants have marched past, and carry it slowly through Horseguards' central low arch. There's heavy traffic to negotiate across Whitehall, and then (with a short speech) they hang the wreath from the metal railings outside the Banqueting House. The precise anniversary of Charles's execution will go unmarked this morning, but this leafy ring will bear witness to that frosty day many winters past when Parliament consented to bloody regicide. Not a bad turnout, I thought. A hundred people turned up outside Sloane Square station yesterday morning, each keen to wander the streets of Belgravia and discover more about the rich folk who live(d) here. There being so many of us we were split into two tours, each under the tutelage of a separate leader. My half's guide was Stephanie, who used to be an elephant-keeper at London Zoo, and was therefore highly adept at keeping a large group of wanderers under control. She does this for a living, working for the excellent London Walks, and we were to follow a route that usually costs punters eight quid. Bargain. We headed first for the Pimlico Road, home to an upmarket agglomeration of designer boutiques. When the moneyed classes of Belgravia fancy a new bathroom, or silver candlestick or floral print handbag, how fortunate that so many local businesses are falling over themselves to offer such services. Viscount Linley runs a bespoke furniture store at the foot of Passmore Street, not especially busy with punters, but then I guess it only takes one sale to rack up a hefty profit. Stephanie paused us in Bunhouse Place because here's where the original Chelsea buns were baked, and to point out the Peabody homes where many Victorian servants hereabouts rented an apartment. 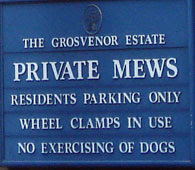 Workers often needed to live somewhere close to their masters, for example all those humble mews houses which now sell for a million plus, tucked round the back of the larger villas. The famous residents and ex-residents came thick and fast. Mozart lived in Ebury Street, only for a brief stay, and only as a young child, but long enough for him to compose his first two symphonies. Round the corner, in Belgravia proper, Noel Coward was bombed out of his home and went to stay at the Savoy. That, said Stephanie once we reached Chester Square, is where Andrew Lloyd Webber now lives, a few doors down from Mary Shelley's old place. She wouldn't take us over to the townhouse at number seventy-something, the one with a 24 hour police guard on the doorstep, but yes, blimey, that's where Margaret Thatcher lives out her remaining days. Surprisingly close to Victoria station, her gaff, but tucked away in a secluded spot overlooking private gardens, and offering precious anonymity. Where the identikit buildings stop, the Cadogan Estate begins. This is a bit nearer to Knightsbridge, a little busier with people, but still an insanely desirable place to live. A Bentley parked up beside a Range Rover beside a Mini, that's the sort of roadside combination that's normal here, and a personalised numberplate often de rigeur. We turned off down a narrow mews beside the Prince of Wales' dry cleaners to see the anonymousflat where Judy Garland committed suicide [photo]. And finally to the hotel where Oscar Wilde unwisely turned himself over to the police, and where mistress Lillie Langtry had rooms. Here Stephanie bade us farewell - I suspect thirty minutes short of the tour she normally provides, but then it was damned cold, and we'd paid her no more than thanks. The entire walk runs next on March 10th, should you be interested, because you get so much more out of a Belgravia stroll with an expert to guide you. If you're interested in one of today's free walks, good luck. You'll have to dig your way through this user-unfriendly database, which lists each walk separately beneath a not-especially informative header. The Walk London website used to display these special walking weekends so much more practically, via an appropriately detailed one-page overview, but I can only assume the project has had its budget cut substantially so can no longer afford a bespoke coding solution. Anyway, I've dug around and can tell you that two thirds of the weekend's walks are merely short strolls in the heart of town, many of them repurposed Walk London walks. They'll be good, but if you fancy something longer and healthier then today's only options are Capital Ring section 12, the Thames round Richmond, a short trek across Epping Forest and half of the Regent's Canal. Walk out to winter - your mind and body will thank you for it. I'm writing this from my new sofa. You won't know how exciting that is, not unless you're one of the six readers who've seen the old one. My old sofa is a design aberration, a ghastly concoction of mostly-orange striped fabric. There are some brown lines in there too, for good measure, plus a colour that probably used to be white, but no longer is. The fabric looks like it was created in the 1970s, which is the last decade in which this particular combination of orange, tan and tangerine was deemed fashionable. You wouldn't have it in your house, not even on a pseudo-retro vibe. My old sofa has a thin upholstered base, barely enough to lift a man off the floor. On top of that are a pair of limp cushions, all thin and weedy, encased in the same garish orange fabric as before. These don't attach anywhere, they merely drape feebly from the back of the seat, attached by a combination of friction and misplaced optimism. That's until gravity kicks in and they slump uncomfortably downward into a squished heap, leaving nothing to support my back. My old sofa is bloody uncomfortable to sit on, and hideous to look at. That's not a great combination for any living room furniture set-up. I dimmed the fabric by covering it with a throw - still mostly orange, but rather more muted. But the uncomfortableness could only ever be hidden, not disguised. Sitting and watching anything on the telly, long-term, was never a truly relaxing experience. So why the hell did I put up with it for so long? Ah, because my old sofa wasn't mine. My landlord must have bought it, because it was here when I arrived, and I've been lumbered with it in my living room ever since. When you rent somewhere you can't chuck out furniture just because you hate it, you have to put up with its hideousness for far longer than any owner occupier would. But nag enough, or moan occasionally, and a miraculous new dawn may one day occur. And yesterday, I'm delighted to say, was that day. My new sofa isn't orange, not in any way. It's a very 21st century shade of dark grey... probably charcoal, I don't know, I didn't order it myself. It has proper cushions that are actually comfortable to sit on, and don't slide all over the place after you sit down. It has presence, and a bit of style, and doesn't look like it was picked up for a tenner from one of those dodgy second-hand furniture shops down a London backstreet. Blimey, I finally have a non-embarrassing sofa, one I won't need to apologise for should visitors arrive. My new sofa has arms that are nearly flat, but not quite. I went to rest a drink on one earlier, hoping to take advantage of exciting new beverage-location options, but held back just in time before the instability caused liquid spillage. I'm still not quite sure how wipe-clean the fabric is, and would rather wait longer than a few hours to find out. I've already had to fish out a TV remote control from down the side of the seat cushions, in a gap I never used to have, although I'm fairly sure there are no coins lost down there yet. Give it time, and my sofa won't look quite so delivery-fresh as it does today. I'm writing this from my new sofa. I'm stretched out from end to end, resting my back against a support which never used to be there, tapping away on a carefully positioned laptop. It's unbelievably comfortable, not in any objective way, but based purely on the difference between then and now. I might even be more likely to sit and watch the telly for longer, or relax with the paper, or even nod off, now I've entered my new sofa era. I'm not entirely sure where my old sofa has gone. I'm hoping it was taken to be thrown away, because it has absolutely no redeeming features, and I'd hate to think any landlord was foisting it on some lesser undeserving tenant. But if you see my floppy orange-striped sofa down at the tip this weekend, do let me know. I never want to see the horrible thing again, but it'd be great to know that no other poor bugger ever will either. Six months! yadda yadda opening ceremony! yadda yadda security nightmare yadda yadda eyes of the world yadda yadda plucky British athlete with medal chances yadda yadda plucky British athlete with no chance in hell yadda yadda legacy legacy yadda yadda betting syndicate corruption yadda yadda official sponsors yadda yadda win tickets to the 100m final! yadda yadda peak fitness yadda yadda a landscape transformed yadda yadda but how many hospitals could we buy instead? Six months! yadda yadda major arts festival yadda yadda clampdown on ambush marketing yadda yadda industrial killers sponsor stadium wrap yadda yadda mounting anticipation yadda yadda dirty bomb yadda yadda yadda yadda skyrocketing security budget yadda yadda legacy legacy yadda yadda striving for excellence yadda yadda spotlight on youth yadda yadda a fortnight of misery yadda yadda ooh, it's Tom Daley yadda yadda they're paying tube drivers how much? Six months! yadda yadda hardly seems like six years yadda yadda transport meltdown yadda yadda banging the drum for Great Britain yadda yadda injury worries for prime medal hope yadda yadda riding roughshod over the local community yadda yadda ticket resale disaster yadda yadda iconic architecture yadda yadda brings no benefits to the North yadda yadda legacy legacy yadda yadda on time and under budget yadda yadda but is anybody actually interested in volleyball? Six months! yadda yadda spirit of 1948 yadda yadda proud to accept only Visa yadda yadda inspirational Paralympic stories yadda yadda London's transport choked yadda yadda a once in a lifetime opportunity yadda yadda seriously, the Copper Box? yadda yadda twenty twelve yadda yadda legacy legacy yadda yadda it still looks like Lisa Simpson to me yadda yadda inspiring young people to take up sport yadda yadda I'm leaving the country when it starts yadda yadda bring it on! The Mayoral Cycle Hire Scheme Sponsored By A Major High Street Bank is extending east. The announcement came back in 2010, that the chunky-framed bikes would be appearing across Tower Hamlets, almost but not quite as far as the Olympic Park. Planning permission had to be applied for, way back last summer. And suddenly now, without fanfare, the first Expansion Area docking stations are up and running. If you don't believe me, check the map. Installation happens slowly, then very fast. Let me take the Bow Church Cycle Hire docking station as an example. Back in November contractors came along and tweaked the pavement to impregnate it with metal connectors. Then they went away, leaving a flat wide pavement beside the segregated Cycle Superhighway. On Tuesday evening, still nothing. But by daybreak on Wednesday morning, a chunky black terminal had appeared, tall and proud. It's covered with maps of the local area and a list of fees, plus a backlit electronic keypad awaiting input. Almost ready, but yesterday morning the mechanics weren't yet operational... as announced by a temporary sign on the top and a total absence of anywhere to park a bike. But by Wednesday evening, there were 39 places to park a bike. I was expecting more - the original planning application had requested 77 - but even half that total looks more than adequate already. A pristine row of 39 blue plastic bank adverts, jaws gaping, are waiting to accept their first docked two-wheeler. There are no bikes yet because the system's not quite ready to accept them. But that's not the case round the corner at the end of Bromley High Street. This is the closest docking station to the Olympic Park - entirely non-existent a few days ago, yet already fully operational according to TfL's online map. Indeed, as I write, the eastern half of Tower Hamlets already has four docking stations up and running. These four stations are so far from the existing Cycle Hire zone that it's no surprise they're currently empty. But as soon as somebody chances their luck and rides out this way (or as soon as the contractor delivers a first truckload), expect the Tower Hamlets Cycle Hire revolution to be underway. Thursday pm update:: Ah, those four docking stations are installed but are not yet operational. Some overzealous soul added them to TfL's map prematurely. They've now been removed. I can't say I'm itching to join up. I hear tales of broken keys, inappropriate fines and customer dissatisfaction, which doesn't inspire my participation. And then there's the perilous state of Bow's Cycle Superhighways - even those which haven't yet injured anybody - whose half-hearted lane-sharing gives me no confidence whatsoever to take to two wheels. Alas as a pedestrian at Bow Church, all that Barclays' cycle improvements have so far done is to shrink the pavement three times - once for CS2, further to accommodate a docking station, and imminently for laterally-positioned bikes. I would bring you a photo of the new Bow Church docking station, except it was dark when I spotted it, so you'll have to imagine. Instead here are photos of where it's been placed, between the lamppost on the left and the lamppost on the right. And a special hello to TfL's cycle-infrastructure contractors, should they be reading. 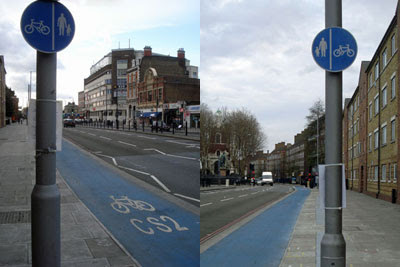 Back in the summer when you added CS2, you attached an incorrect blue circular sign to each lamppost. The sign you fixed saying "Cycle Superhighway 2 on the left, pavement on the right", sorry, reality says otherwise. And the sign you fixed saying "pavement on the left, Cycle Superhighway 2 on the right", sorry, reality says otherwise. While you're in the area adding our docking station, maybe you could swap the two signs over? It'd be good to remove this particularly cretinous mix-up from Bow Road, before anybody else spots it. If you're not too busy. Many thanks. Are timetables dumbing down, or are they becoming more accessible? They used to look like this (which, for the London Overground, they still do). Proper timetables, one column per train - a format you have to understand to be able to read. It's great for those of us who "get it", but beyond the complexity some can cope with. A tabular structure is useful when when routes are linear and departure times are fixed, allowing savvy customers to plan ahead via different options, and replan if circumstances change. But the way timetables are going is like this. London's transport network is complex, so best not trouble the passenger with unnecessary detail. Provide a start and finish time, then click to discover the route the computer has carefully selected. "Journey planning" doesn't allow you to think outside the box, merely to pick one of the travel options provided for you. Online this is the default option, for National Rail as well as TfL, even for routes with infrequent very simple timetables. We've become transport sheep, because it's simpler to spoonfeed us this way. This is the Saturday daytime timetable for number 96 buses leaving Bluewater. All buses are scheduled to leave at specific times, because this is the start of the route, and the bus company knows precisely when these departure times are. But this timing information is no longer passed on to the public, as it would have been in the old days. Instead we're told the approximate intervals between buses, and roughly how long it takes to get to places en route, because that'll do. Indeed this is no longer a timetable, merely a "don't worry, you won't have to wait long". Which brings us to the DLR. Someone, somewhere, somehow, has allowed DLR timetables to become extraordinarily unnecessarily complex. A giant poster that's mostly white space. A map showing how long it takes to reach various stations in ridiculously tiny type. And various panels for different days of the week in different directions, if you can work out what's what. Go and look at Greenwich's DLR timetable if you want a typical example, or Blackwall for something with bifurcation complications. Instead let me offer you a slightly simplified version of Saturday's timetable for Bow Church southbound, which is fairly typical of much of the network. There is good news for those who think DLR timetables have jumped the shark, which is that they're about to change. "Following customer feedback a new timetable design poster has been developed. From 30 January these posters will provide information in a simpler, easy to read format." That sounds very promising, maybe, unless simpler means "dumbed down", and easy to read means "devoid of all underlying information". The way timetables are going, aimed at mobile-friendly lowest common denominator, I have my doubts. But let's see what appears on the new DLR posters before passing judgement. And so long as the updated design directs me to Bow Church at "something-ty-nine", rather than "turn up and wait", I hope I'll be happy. 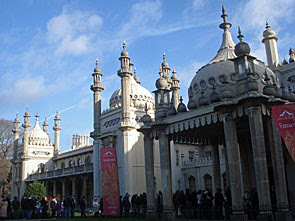 Officially it's the Royal Pavilion, having been created as a seaside bolthole for the Prince Regent at the end of the 18th century. It's an astonishing building, bedecked with domes and minarets outside, and exquisite decor within. But it started out as a farmhouse, believe it or not, which became embroiled in the Georgian equivalent of Grand Designs. Prince George first rented this lowly property for liaisons with his beloved Mrs Fitzherbert, at a convenient distance from court in London. His architect then expanded the property to become the Marine Pavilion - a mere three rooms around a central rotunda - and this was expanded further during the Regency. 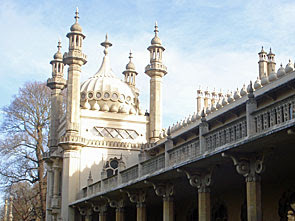 Designer John Nash added additional rooms and flourishes, within and without, to create the Brighton icon we see today. But he scrimped a bit in creating an external illusion without much substance immediately underneath the roof, and the building's been a conservation nightmare ever since. Queen Victoria didn't care for it much either, especially when the railways brought daytrippers to what had previously been coastal seclusion, so sold the place off and nabbed many of its contents to help fill Buckingham Palace. And it's been in the ownership of the municipality of Brighton ever since. Once a year they open the doors of the pavilion for free. This used to be for residents only, as the lady behind me in the queue kept repeating to her husband, gazing downcast at the number of visitors wanting to take a look inside. The queue stretched all the way round the "Conservation Area Keep Out" back as far as Brighton Museum, and apparently it didn't used to be that long in the good old days. I kept very quiet as an out-of-towner enjoying my good fortune, until a passing friend bowled over to say hello and somewhat blew my cover. If nothing else the enforced wait permitted those queuing to admire the pavilion's outer structure, all towers and frilly bits in an extreme Indian style. Whether the ornate spikes were deliberately seagull-proof, that's a matter of conjecture, but the roof remained bird-free while we watched. Forty-five minutes to reach the front, that's how long it took, and still the families and retired citizens of the borough continued to pile onto the back of the queue behind us. I'd not been inside the Pavilion since the 1970s, and I'd forgotten quite how wow it is. I'd also forgotten that the interior isn't Indian at all, almost entirely Oriental, starting with the main corridor along the ground floor. Rich decor greens the visitor, all dark reds, golds and greens, with illustrated lamps dangling down to add to the Chinese illusion. But that was nothing compared to the Banqueting Room, at which the designer seemed to have hurled every opulent trick in the book. The huge dome is decorated with 3D plantain leaves, from which hangs a dragon, from which hangs a glittery chandelier so massive it'd no doubt kill you if it fell. The walls are tiled almost like snakeskin, while at the centre is the long dining table at which the Prince impressed his guests. His kitchens are nextdoor, top of the range in their day, still with copper pans of all kinds stacked waiting for use. He did love his food, did George, which explains why he ended up with a 55-inch waist and eventually died from excess fat on the heart. The Music Room, at the opposite end of the building, is wow-er still. In an age before cinema and TV, the long dark evenings were perfect for musical entertainment, and here guests could stare in awe as well as listen. A snake still curls down the pillar beside the curtain, several lamps hang like water lilies from the domed ceiling, and stained glass panels shaped like eyes stare down from above. It's like all the excess from a dozen Chinese restaurants crammed into one imposing interior, whilst still retaining an optimum of taste. The Music Room also provided the first chairs on the way round, which permitted several of the more elderly visitors a chance to rest their legs before climbing the bamboo staircase to the first floor. The King's apartments are upstairs, with one of those grand beds that needed steps to climb into. Queen Victoria's chambers are at the opposite end, not that she stayed here much, but her presence has allowed the curators to make a fuss of a few smaller rooms. All the furniture and various artefacts scattered throughout are numbered, for the benefit of those with a guidebook, although the labelling reminded me of an auction, or perhaps a rather grand tombola. In a sideroom are a few information panels recalling the Pavilion's lengthy story, especially the persistent water damage that's been a problem ever since George's day. And there's a tearoom, obviously, before the guided path leads out into the gift shop, obviously. It had been an overcrowded circuit, sharing each room with a shuffling mass of appreciative locals, which hadn't always made appreciation of each room easy. So I'd judge the spectacle as best enjoyed by paying £9.80 and coming round on a quieter day... which should be any day before same time next January. And prepare to go wow. » Brighton Museum and Art Gallery: A short distance from the Pavilion, in a similarly domed building that used to be the stable block, that's where Brighton's town museum has its home. It's an eclectic mix, of both local and wider interest. Two galleries concentrate on Brighton, as you'd expect, one the public-facing tourist angle, the other more about the town itself and how it grew. There are two tiny rooms stuffed with Egyptology, very nicely presented, and a long gallery given over to a history of 20th century design (as if I hadn't seen enough collections of chairs at the Design Museum in London earlier). Upstairs there's art and a cafe, plus an intriguingly themed room of "performance"-related ephemera, which is almost a bit Pitt Rivers. If you ever do the Pavilion, don't skip the Museum. 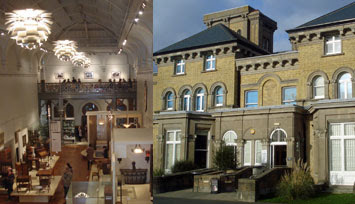 » Hove Museum and Art Gallery: Forty minutes walk up the road, across the border into sophisticated Hove, a very different museum. From the outside an understated townhouse, and inside a cosier, homelier experience with a nod towards the younger members of the family. The toy collection is housed in the Wizard's Attic, which is beautifully atmospheric, and for older visitors there's a room full of very early flickery movies, local or otherwise. Several mums and dads had brought their offspring to see the Robot Invasion exhibition - two small rooms in which Sussex artist Chris McEwan is showcasing his collection of robots and space toys. They're delightful, all vintage tin and plastic, lined up in colourful cases... at least for the next few weeks. It's been years since I visited the Design Museum, or at least any floor higher than its excellent shop, so yesterday I went back and reacquainted myself with its contemporary collection. The far end of Shad Thames isn't somewhere you'd visit by mistake, not unless you're a tourist walking the South Bank east until it goes no further, in which case it's precisely the sort of place you'd end up. A converted banana warehouse in the shadow of Tower Bridge, revamped in Modernist style, opened for public display in 1989. The man behind the founding of the museum is Sir Terence Conran, who owns several of the restaurants hereabouts, and he's the subject of the main exhibition on the first floor. He's 80 now, which provides the excuse for a full scale retrospective of his works, his legacy and his influences. Young Terence's interest in design sprang from visiting an exhibition of austerity exports at the V&A in 1946, thinking I could do that, and slowly working his way up. Some of his earliest scribbles are on show, plus a variety of Fifties fabric designs of the kind your grandparents might have had had they been beyond trendy at the time. I settled down to watch a short 70s documentary about Sir T's work, filmed by Peter Greenaway no less, only for the room to be invaded by a pair of arty middle class parents and their offspring. Mother was semi-keen to watch the film, whereas the two young daughters only wanted was to sprawl all over the seating and scribble in their kiddie quiz leaflets. Both parents then attempted to use the mini-theatre as a kind of babysitter while they went off to look at some chairs, but soon had to return to remove their ill-behaved progeny, whose plaintive cries of "but I want to watch the film" could be heard from outside for several minutes afterwards. There were a heck of a lot of chairs to look at. From Conran's iconic 1960s wicker cone to later curvaceous leather curves, they provided an excellent opportunity to view his progression in style through the decades. A major section dealt with Habitat, the iconic High Street store which brought affordable design to the masses (I'm sure I recognised the cover of the 1974 catalogue from my parents magazine rack). Food also merited its own corner, combining utensils, crockery and Tezza's various high-dining restaurants. I lost interest slightly in the penultimate part, focusing on some sculptor bloke that Conran is promoting, then perked up rather at the recreation of his study complete with shelving units filled with hundreds of his actual books. Worth a look. The top floor exhibition isn't always a hot ticket (I believe a roomful of shoes is threatened for later in the year). But this is a winner, an assemblage of design icons from a broad range of product categories, laid out to show creative progression. 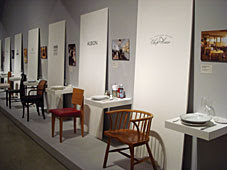 A whole wall of chairs, obviously, because chairs define design defines chairs, or something. A big chunk of anglepoise lamps, obviously, because this is a design museum and that's what they do. But also a few less obvious selections, like a brief history of powered fans (from swirly blades to Dyson hoops) and an entire calculator retrospective. The museum owns half a Mini, sliced lengthwise, so that's on display between a Vespa and a Moulton. 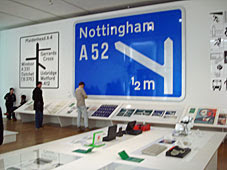 And for lovers of graphic design there's a wall of road signs, Kinneir & Calvert style, including a full size motorway sign (blimey, full size is big) and the small scale mockups that Jock and Margaret used in their initial presentation to a sceptical Ministry of Transport. Nearby stands a red phone box, as you'd expect, but also a single UK traffic light, designed in the mid Sixties by David Mellor (not that David Mellor) and still ubiquitous today. The crowd looking around on Saturday seemed appreciative, in a respectfully middle class way, although I think I'd have fitted in better if I'd had a beard. Exhibition closes this afternoon, last chance to see. 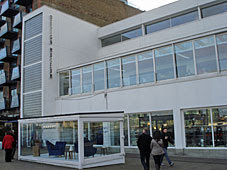 It's hoped that even more of the Design Museum's collection will be on display from 2014, when the entire operation ups sticks from the South Bank and moves into new premises in Kensington. That'll be the old Commonwealth Institute, whose empty shell museum staff proudly showed off last Open House weekend, much to my delight. Best of all the new place will be three times larger than the old, which means they can get much more of their collection out of storage and there'll be much more to see. I'm still never convinced that there's enough to see in the current building, which is why I don't go more often. Two floors of exhibits is all you get, and whether that's value for money depends entirely on whether an interesting pair of exhibitions is scheduled. Green Man crossing time is reduced to the legal minimum. Countdown time is extended to compensate, but capped assuming a walking speed of approximately 1.2 m/s (2.7 mph) Cars can set off quicker, because it's easier to guarantee that pedestrians are off the crossing. And the main lights are green more often, which keeps the traffic moving for longer, which is what the Mayor and the motorist likes. At the Oxford Circus X-crossing the Extra Green Time for traffic is 61 seconds per hour, and at Finsbury Square 3 whole minutes. To check it's not pedestrians being royally shafted, the report accompanying the trial has some reassuring statistics. At the eight sites involved, the proportion of Red Man Time during the trial was 81%, compared to 82% before, so that's a slight improvement. Less reassuringly the Average Maximum Wait Time increased at Holborn/Kingsway by 3 seconds and at Tower Bridge by 7, whereas at Oxford Circus it decreased by 9. Swings and roundabouts. Having used the system a fair few times, I'm with the 83%. It's good to know when the traffic's about to start moving again, and to adjust my intentions to match. I'm fit enough to dash across the road even when the Countdown's ticking down 4...3...2...1... and were I no longer as mobile I'd appreciate knowing precisely whether I did have time to hobble across or not. So bring it on, even if initially it's only at a very restricted number of sites. Countdown is progressing. If you like nerd-level transport statistics, graphs and tables, then you might appreciate reading the entire 39 page PCaTS report. If you don't have the time nor the inclination, here are ten potentially interesting facts gleaned from within. » On average, before the trial, pedestrians faced 9 seconds of Green Man Time followed by 9 seconds of Blackout. On average, during the trial they faced 6 seconds of Green Man Time followed by 12 seconds of Countdown. Same total, differently proportioned. » The average percentage of participants feeling safe increased across all sites from 73 to 91%. » It was found that fewer pedestrians felt rushed with the package of measures installed. On average across all sites the percentage feeling rushed decreased from 39 to 23%. » Irrespective of the type of crossing, the majority of pedestrians tended to cross as soon as possible after their arrival. Over 54% crossed within 5 seconds of arriving, 70% within 15 seconds and approximately 85% within 30 seconds, regardless of the pedestrian signals displayed. » A large percentage of pedestrians started to cross whilst the Red Man was showing: on average 68%, consistent with pedestrians being unwilling to wait. » With PCaTS, 33% of the pedestrians who sped up did so during the countdown: 12% did so in the first half of the Countdown and 21% in the second half. » There were significantly more (up to 12%) pedestrians still on the crossing 6 seconds before traffic gained priority, and up to 9% more on the crossing at the start of the traffic red/amber (i.e. at -2 seconds). However, this difference then rapidly reduced until there was no difference between crossing types at the point when the traffic signals changed to green (i.e. at 0 seconds). » There was some evidence that vehicles started to move forward slightly in advance of the green phase, in particular motorcycles and cyclists. This may be because they are able to use the Countdown displays as an indicator themselves. » The PCaTS study was completed in May 2011, but it's taken until January 2012 to announce that the trial was a success and will be rolled out further. » Of the 200 road junctions where PCaTS is being considered, there are none at all in Kingston-upon Thames, Ealing or Bexley, and only one or two in Hillingdon, Harrow, Richmond-on-Thames, Sutton, Barnet, Redbridge, Barking & Dagenham and Havering. The lion's share will be in Central London, especially Westminster and the City. I am the only person in the restaurant wearing a checked shirt. I thought I'd dress up a bit, no slobby jeans and casual top, but I fear I may have judged wrongly. I've come dressed for Shoreditch, but everyone else appears to have come straight from the City. Smart suits, power-blouses and shiny shoes are the order of the day, mostly in solemn black, so my semi-decent attempt at sartorial elegance looks very out of place. BestMate reassures me that the restaurant was nigh empty the last time he was here. Not tonight. Every table, every sofa, every gap at the bar is taken, by a collective of bankingfolk continuing the business of the day. Even if the conversation's more informal than official, it'll oil the wheels of commerce when the markets reopen in the morning. I realise how fortunate I am that my job finishes when I leave the office. Many of these financial whizzkids are here out of obligation, not a desire to be sociable. I'm wearing trainers, for heaven's sake. Fairly smart trainers, nothing I've previously walked down a muddy footpath, but nobody else in the building would have dreamed of turning up in anything less than leather. It's strange how a couple of miles, or even a few walls, can completely change the expectation of what punters inside a venue should be wearing. In E1 I'm sure I'd have got away with smart trainers and plaid. But the suits in Investment Country are no doubt thinking "who is that oik? ", even if only surreptitiously. We're dining out on one of the Evening Standard's special annual cut price restaurant offers. For a half-decent price we'll have a three course meal and a glass of champagne, probably for considerably less than then the party quaffing on oysters and fizz at the table alongside. It's bonus season in the City, which would explain the preponderance of post-office ladies and gentlemen splashing out some of their six figure windfall on booze or an epicurean blowout. I feel so utterly out of place standing at the bar, but the opportunity to people-watch is irresistible. Cocktails... those'll help us fit in... so we both skim down the slimline menu of classics and house specials. I plump for a glass of ice with fruit juice and a kick, while BestMate ends up with much the same but in a differently shaped glass. I haven't eaten anything since lunch, so I'm very impressed when a micro-pot of mixed nuts appears on the counter beside us, whereas the top inch of my over-priced glass probably paid for the catering pack being slowly emptied in the corner of the bar. We make an unspoken faux pas as we pay for our drinks, waving an actual banknote and handing it over the bar. Everyone else is on plastic, tapping in a few numbers at regular intervals, or piling up their credit for one final reckoning at the end of the evening. We get a single coin in change - one gets the feeling the staff don't deal with coins very often - but there's gratitude when we hand the coin straight back as a tip. When in doubt, pay twice. That couple over there, he in the dark suit and her in the sophisticated dress, they're not husband and wife are they? He's all over her, increasingly so as more alcohol is consumed, while she gazes back with unspent wilful desire. It's the culture round here to work late at the office, but these two look like they'll be engaged in more than secretarial duties before the evening's out. Meanwhile the woman beside us is hunched up across two footstools, laptop open, furiously keeping in touch with her inbox via wifi. She has a very different night-time relationship with her manager, less physical, but still persistently intertwined. A different career, a different set of priorities, and I could have been a financial whirlwind rounding off the day with a succession of celebratory glasses. Instead I'm the interloper here, ill-versed in share options and high yield bonds, marked out by my misplaced urban uniform. The waitress wanders over to invite us to our table, where the el cheapo menu is produced. We leave the dealers, the revellers and the canoodlers at the bar. The City, it's true, never sleeps. 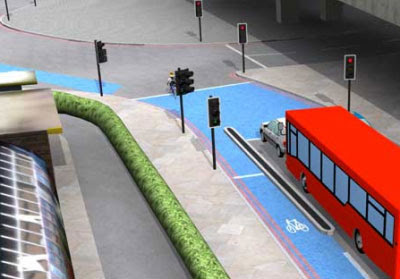 Last week TfL announced they'd be making cycling-friendly improvements at the Bow Roundabout. Nothing too intrusive, they said, because they didn't want any "knock-on disruption" which would lead to "significant additional road queues on the east and westbound approaches". A couple of potential options have been proposed, each supposedly to aid cyclists' safe progress. Yesterday I looked at option 1. Today, let's look at option 2. Reducing the Bow flyover from two traffic lanes to one in both directions, with new dedicated cycle lanes. On the face of it, this sounds like a great idea. Allow cyclists safe passage across the Bow Flyover, and then they won't have to go anywhere near the killer Bow Roundabout. Indeed, it seems that's what the majority of cyclists do already. According to TfL, "Currently around 60 per cent of all cyclists that travel through the area use the flyover, which provides a straight line from Bow Road to Stratford High Street." That's a serious indictment of current cycling policy hereabouts. 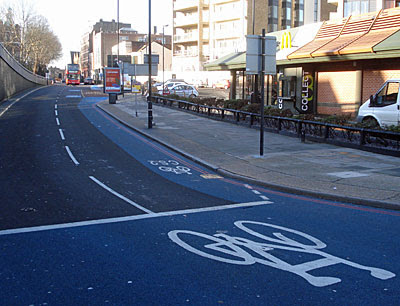 TfL and their friends at Barclays have spent thousands of pounds adding Cycle Superhighway infrastructure to the Bow Roundabout, yet most cyclists deliberately choose to completely avoid it. There would seem to be plenty of room across the Bow Flyover to create a dedicated segregated cycle lane. Eastbound the two lanes of normal traffic could easily be cut to one - there are rarely sufficient vehicles to justify two lanes, and the narrowing might slow down speeding cars a bit. Westbound there's already only one lane of traffic, so shifting it across for a new cycle lane shouldn't be a problem. Some cyclists might be put off by the incline, but it's not that severe, merely atypical for contour-free east London. Still sounds like a great idea, But, alas, there is a majorly impractical problem at either end. 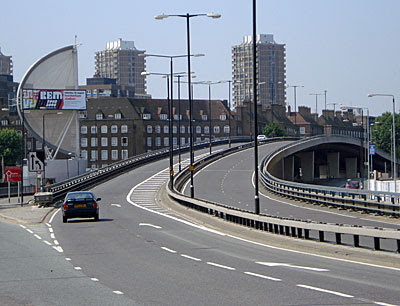 The Bow Flyover veers off from the right hand lane of traffic, whereas the existing cycle lanes run to the left. This means, for any cycling improvement to be truly safe, some means has to be found of linking the two together across all the intermediate lanes. And that's not easy, when TfL's express desire is not to hold up the flow of traffic for other road users. At the moment 60% of cyclists are negotiating this lane change by themselves, pulling out diagonally in front of cars and buses and lorries, and risking life and limb in the process. It looks bloody dangerous to me, watching from the pavement, and if the flyover is to be the new safe route then it can't continue. Traffic signals could be installed at either end of the flyover to make access safer for cyclists. TfL's proposal is for four additional sets of traffic lights, one at each end of each side of the flyover. They'd be toucan crossings that only work when a cyclist presses the button, which means no chance of sailing through without stopping. I'd imagine this'll be especially annoying when riding (wheeee!) down the far side of the flyover, speeding downhill and then having to stop at the bottom to change the lights. But that's not the really stupid thing. The really stupid thing is TfL claiming they want to avoid "significant additional road queues on the east and westbound approaches", and then installing four new sets of traffic lights. If option 2 goes ahead, one of the new sets of traffic lights will be installed here on the eastbound approach to the flyover. 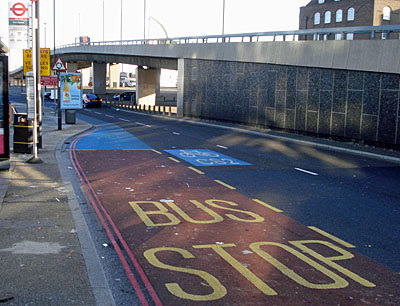 Cyclists will get to wait at a new toucan crossing, roughly where the bike is painted, then ride out diagonally to reach the end of the flyover. Other traffic using the flyover won't be halted - the lights won't affect them. But buses, cars and lorries attempting to reach the roundabout will be halted, approximately 100 metres after the last traffic lights (pedestrian crossing, Bow Church) and approximately 150 metres before the next (traffic lights, Bow Roundabout). It may be unintentional, but this cycling improvement adds further delays for the motorist and bus passenger, possibly as bad as installing a special cycling phase at the roundabout proper. On the far side of the flyover, the new set of traffic lights would be just beyond Marshgate Lane, which is the main entrance to the Olympic Park. It'll have to be designed in conjunction with the existing set of traffic lights, but that's not going to be in any way efficient and will result in slowing down all traffic. The third set of lights would be across on the westbound approach to the flyover, this time narrowing the carriageway to one lane rather than two, which won't help smooth the traffic flow either. And back over on the Bow side of the flyover, still westbound, would be the fourth and final set. Again, these would interrupt traffic flow 100 metres after the previous lights (Bow Roundabout) and 150 metres before the next (pedestrian crossing, Bow Church). In total there are already six sets of traffic lights in the half mile from the Bow Flyover to Bow Road station - this new scheme would add a seventh. So that's option 2. A safely segregated ride over the flyover for cyclists. But also four new sets of traffic lights at either end to slow down the traffic. And still every possibility that cyclists won't opt to pause and push the button, but will instead continue to divert across the traffic to reach the flyover as 60% of them do now. Oh, and still absolutely bugger all to help us local pedestrians cross safely. Sorry, I'm still not impressed. Two substandard options, both falling short of accessible practicality, are no success at all. Last week TfL announced they'd be making cycling-friendly improvements at the Bow Roundabout. Lots of people applauded. But at the moment they're only "potential improvements", subject to public consultation, and there are a couple of different options up for grabs. Today, let's look at option 1. A cycle 'early-start' phase at the traffic signals on the eastbound and westbound entrance to the Bow roundabout. This would provide a dedicated green light phase to allow cyclists to travel ahead of other traffic. On the face of it, this sounds like a great idea. Allow cyclists onto the Bow roundabout a few seconds ahead of vehicular traffic, and then no driver turning left can accidentally run them over. Temporal segregation is to be achieved with the aid of an advanced-stop line and some extra traffic lights, the combination of which will give cyclists a proper head start. TfL have kindly provided a video to help you understand how the redesigned layout might work. But while you watch it, keep a careful eye on the phasing of the various traffic lights. And then see if you agree with me that perhaps this isn't an ideal solution after all. Here's what happens at the revised roundabout junction if you're a car driver.  If the main lights are red you stop at the stop line, just like you do now.  If the main lights are green you continue onto the roundabout, just like you do now. If you're a car driver, essentially, nothing changes. Here's what happens at the revised roundabout junction if you're a cyclist.  If the main lights are red then your light is green, so you pass through to the red light at the advanced stop line and wait there.  If the main lights are green then your light is red, so you have to stop while everyone else drives onto the roundabout. If you're a cyclist, you always hit a red light. So the new arrangements are safer for cyclists, but also slower for cyclists. They'll be held back while traffic alongside is moving, and they'll also have to be held back for several seconds beforehand to prevent cars, lorries and buses catching up from behind. Waiting at this new backstop light is unlikely to be an attractive option. Will cyclists behave and hold back, or will they be tempted ahead, either by jumping the red light in the cycle lane or by deviating into the main flow of forward-flowing traffic alongside? I wouldn't like to second guess which approach the majority of cyclists at a newly designed junction would take, but I bet many will ignore the additional red phase and advance to the front anyway. Additional dedicated cycle lanes on the east and westbound approaches of the roundabout, allowing cyclists to approach the advance stop lines at the junctions without the need to filter through traffic. TfL are pushing this "additional cycle lane" as a positive improvement, whereas in fact it's an admission that the current eastbound Cycle Superhighway 2 is wholly inadequate. 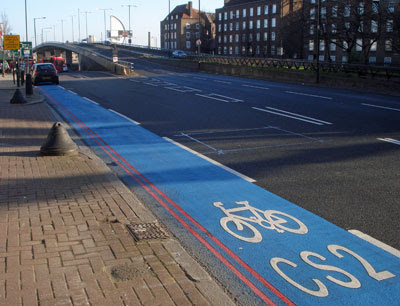 At the moment, you may remember, CS2 is nothing but a painted stripe along half of one lane of queueing traffic, which means cyclists can't reach the existing blue-painted box. 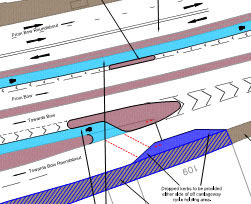 I blogged about this six months ago, calling the existing Advanced Stop Line "an inaccessible white elephant" - essentially an inexpensive "oh that'll do" solution. It's taken two dead cyclists for TfL to propose something they really ought to have done in the first place - carving a safe cycle lane out of the wide-enough pavement to provide proper segregation. Better late than never, TfL, but no thanks to the cheapskate/cretin who sanctioned the original design. But, however good it sounds, there is something dangerously stupid about this new cycle lane. Less than ten metres from the entrance to the new cycle lane, there's a bus stop. If the bus stop's empty, no problem, cyclists can ride straight through into the new indented cycle lane directly ahead. But this is a bus stop served by approximately fifty buses an hour, so cyclists are more than likely going to find their onward progress blocked. They'll have to swing out into the traffic, as now, in order to avoid the big red obstruction. But then they'll have less than ten metres to nip back in again to join the new cycle lane. That's cyclists moving to the left, while the bus in the bus stop will be pulling out to the right across precisely the same piece of road. I don't know about you, but that sounds very dangerous to me. London's finest garden suburb lies north of Golders Green station, along the edge of the Finchley Road. Hampstead Garden Suburb isn't especially famous but, even if you've never heard of it, many of our richer celebrities know it well and have chosen to make it their home. Richard and Judy live here, and Martin Bell, and Katie Boyle, and the last king of Greece, and once Noel Edmonds and Peter Mandelson, but they've both left now. 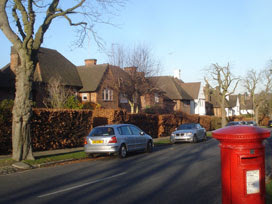 The Garden Suburb was the brainchild of Henrietta Barnett, a leading social reformer from a century ago, who bought up 250 acres of farmland to create a low density, tree-lined estate suitable for all classes. She'd got the idea from Ebenezer Howard's pioneering settlement at Letchworth, but her London version Henrietta would be purely residential, without any measure of industry to support the hyperlocal economy. Hernrietta's first action was to save the Hampstead Heath Extension from development, then in 1906 she appointed Raymond Unwin as her architect and the grand design began. 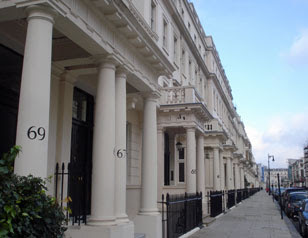 The first and finest architecture lay along the axes of Hampstead Way and Meadway [photo]. Nothing overly huge, just a surfeit of tasteful Arts and Crafts townhouses grouped so as not to become repetitive. There were no fences, only hedges, and angled gables that hinted at country dwellings. The entire estate is a pleasure to walk around, even today. The streets are wide, and the traffic is light (so long as you can dodge the occasional TfL red minibus). Jonathan Ross lives somewhere hereabouts, beneath a French mansard roof, and occasionally holds suburb-busting parties that annoy his neighbours. I saw no evidence of celebrities out on the streets, although there were rather more personalised numberplates parked up than one might normally expect. Even in midwinter, the hedges give the estate a green feel, which was part of the original plan. Enclosed to the north are two patches of woodland called Big Wood and Little Wood, the former large enough to be a secluded wildlife haven. My passage through its muddy paths disturbed robins and squirrels, though I was rather hoping for a close encounter with a dog-walking celeb. No such luck, not even an ordinary human, in this haven of peace. But my very favourite spot was the square on the hill [photo]. 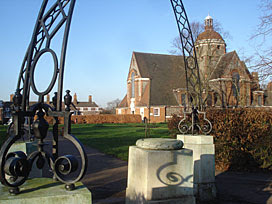 On the Suburb's highest land Dame Henrietta placed "houses for worship and for learning", including an Institute for adult education and two churches. The former is now a girls' school named after its benefactor, but it's the parallel churches that most impress. They were designed by Sir Edwin Lutyens and are superficially similar, with his Anglican masterpiece now Grade I listed. 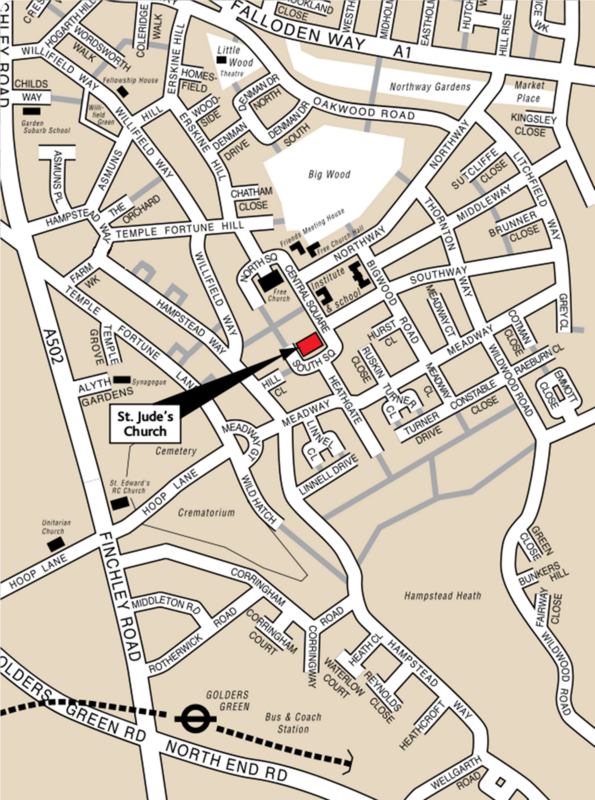 St Jude's is long and high, in tile and brick, with a tapering spire atop a part-octagonal tower [photo]. For a mere parish church it's monumental, and visible across the open fourth side of the square from many miles away. For balance, across manicured grass, lies Lutyens' second triumph. The dome on the roof hints at a Roman Catholic influence, but no, this is a Nonconformist Free Church for the worshippers of NW11 [photo]. It's a salutary thought that had the estate been built 100, even 50 years later, its centrepiece would undoubtedly been a parade of shops... but thanks to Henrietta, thankfully not. Ironically, alas, her classless vision has been eclipsed by an upper-middle desirability, and celebrities are now more likely to move in than you or me. Once inside the shopping centre, I was struck by how no-longer big it seems. Maybe I've been spoilt by the likes of Westfield, Lakeside and Bluewater, but Brent Cross's two-storey mall felt more like a medium-sized High Street in a box. From Fenwick to John Lewis, past the central atrium where some unfortunate salesman was attempting to flog vacuum cleaners, it's not so far. The mall up to Waitrose smelled of baked cookies, while the entrance to both department stores reeked of perfume. At the front of John Lewis I watched an elderly lady with a walking stick pulling her basket ever-so-slowly past the white-coated ladies and their bottles of sample spray. Once they'd have stopped her for a potential sale, but that was decades ago, and now they simply wished she'd pass by quicker. I scanned the Centre Guide for a record store, but in the section labelled "Music and Electrical" the only vaguely musical stores were Apple and the various mobile phone companies. Digital discs are already extinct at Brent Cross, and even the printed word is restricted to whatever WHSmith deigns to stock. But there are 40 different places to buy clothes, which still reels the punters in, attracted too by the promise of free parking (which is not a policy the council employs elsewhere). There are major plans for redevelopment at Brent Cross, not only at the shopping centre but across 150 hectares of the surrounding neighbourhood. New shops will be built on the outdoor car parks and fresh connections made to nearby tube and rail stations [photo]. The River Brent will be revitalised, additional bridges over the North Circular will be constructed, and an attempt will be made to introduce a cafe-culture boulevard with multiplex cinema. Most importantly there'll be 7500 new homes (which, to put the project in perspective, is three times as many as in the Olympic Village). This is a very long term project, taking at least twenty years before the transformation is complete. But, standing in the Tesco/Toys'R'Us car park on Saturday afternoon, I couldn't imagine a better eyesore to wipe from the map and start again.